Penrith. Yes, the city that raises a laugh of pretty much anyone who lives east of Concord in Sydney. It is for many the centre of bland houses, intolerance and cultural desolation. Yet, what needs to be recognised is that Penrith is a city that provides an opportunity for us as a society to get the balance between urban design and nature right. That is because the Penrith CBD, across to the Nepean River is, in part, a blank canvas ready to be used. The Penrith City Council have, along with Panthers, decided to commission a French company, Campement Urbain, to discuss with the community of Penrith to design a new way for the city of Penrith to look and work. It is a bold and outrageously good idea, due to the one big natural asset Penrith has that most other regional centres don’t – the Nepean River. 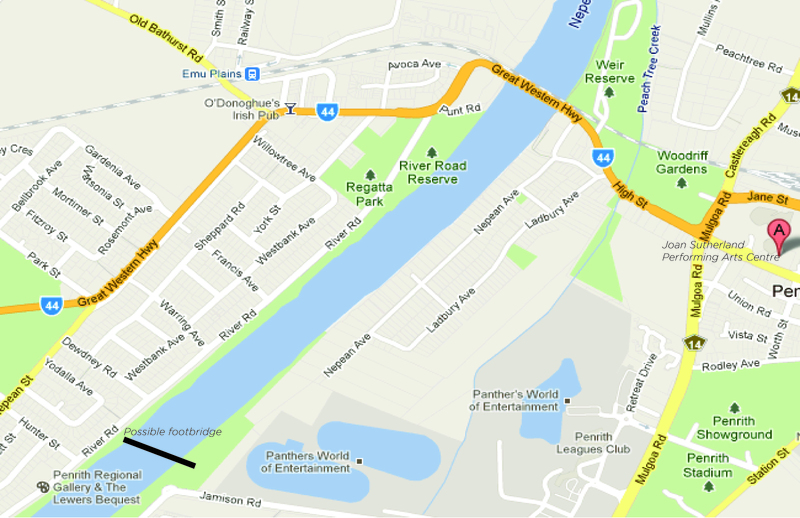 Currently, the Nepean River is accompanied on one side by one hotel beer garden, its restaurant, a rowing club and an underdeveloped park / pathway. And one cafe – a Coffee Club outlet. Back from there, between the riverbank and the big box retailers of Mulgoa Rd are farms. On the other side, in Emu Plains, is another riverside park and pathway, the Penrith City Council region’s most expensive houses and the Lewers Bequest and Penrith Regional Art Gallery (known to many locals as the Lewers Gallery). 1. The Footbridge. Currently, the only ways to walk across the Nepean is via a motorway, which is near impossible to access and the Victoria Bridge, a bridge originally built for Russia, but the Crimean war saw it being diverted to Penrith. In addition, a footbridge / bike bridge would make it much less dangerous to walk from one side of the river to the other. 2. Cafes and a Hotel. The proposal to build cafes on the footbridge and a hotel at one end is not as far fetched as people may think. There is a shortage of good cafes in Penrith, especially ones in relaxing surrounds (the best cafe I know is Lattetude, which is in the middle of an industrial area, near my old hunting ground of Preston St). There are plenty of Penrith and Lower Mountains people who would appreciate the development of cafes and other related businesses in this area of Penrith – and I could imagine people coming from Sydney and other places to enjoy a relaxing afternoon next to the river. I could at this stage suggest that perhaps a bookshop / microbrewery would be ideal somewhere near the river. But that would be much too predictable from me. Hotels are also needed. Penrith doesn’t have a big choice of accommodation and has a need for hotel beds – the best rated hotel is Penrith is the Chifley, next to Panthers – which is hardly the most welcoming location. If the Penrith City Council is serious about staging a push for more conferences and tourists, there would be a need for a hotel, and one next to the river would be a sound idea – though, I suggest, it would be on the Penrith side. 3. Canals and Fountains. Another idea that may would call fanciful is building canals that lead into the CBD from the Nepean – though, is a fantastic idea. The city does get hot in summer and the centre of the city is fairly unwelcoming and desolate. Feeding water from the river into that area, to create water features – if it had little to no impact on the Nepean – Hawkesbury river system – would be a positive move to create amenity for the people of Penrith. 4. Cultural Growth. There is a good argument for creating a culture pathway between the Lewers Gallery and the other excellent community resource, the Joan Sutherland Performing Arts Centre. There could be the possibility of creating various spaces for public art along such a pathway – simply because the western end of Penrith is relatively underdeveloped. Where that pathway could lead would be for the designers to consider. However, to assume that there would not be a demand for such a development is to make bald assumptions about the cultural potential for Penrith. It does have a university, as well as a solid core of people who either appreciate art or want to, given the opportunity. It has long puzzled me why Penrith has been so shunned and under appreciated by those in Sydney, especially considering that it has natural features that many next to which people in the inner city would pay millions. If its cultural facilities matched those in some way, the potential for Penrith par le Nepean would be wonderful. Great commentary on an exciting set of propositions … most exciting is that some decent thinking is being applied to the future of the city.